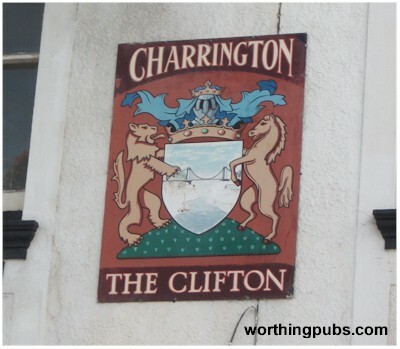 Frank 'Nobby' Clarke was the landlord of the Clifton Arms in 1959. 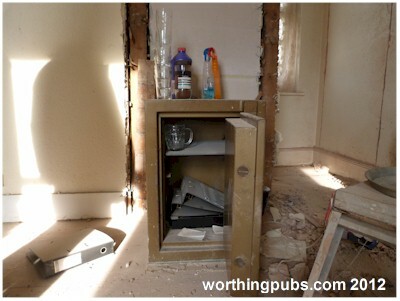 As he was nearing completion of some building work being carried out on the pub and its kitchen he had an idea. He was going to hide a time capsule within its structure. 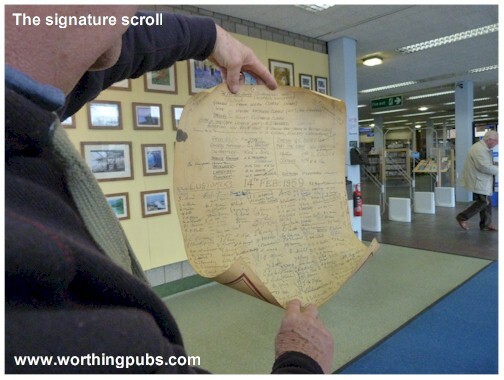 On the 14th of February 1959 (St Valentines Day) one hundred and fifty of his regulars signed a large scroll - the back of a Charrington's poster celebrating its two hundred years of brewing. 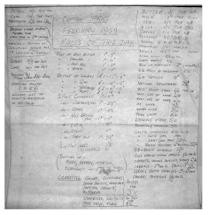 They also included a second scroll listing the price of everyday commodities such as beer, milk, tea, eggs and so forth. 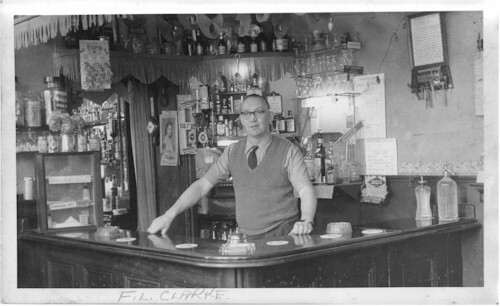 Thoughtfully, Frank included a picture of himself behind the bar (Shown above). All this was tightly rolled up, covered in a plastic dry cleaning bag and hidden in a stud wall in the new kitchen area. 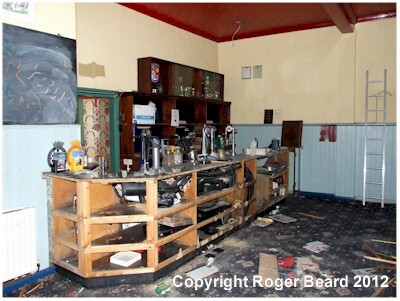 The pub closed in 2010 after a drop in trade, something that was gripping public houses nation wide. It was almost a foregone conclusion that it would never again open its doors and pull a pint. 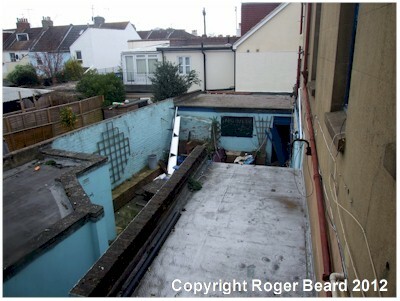 Plans were submitted for a change of use and the building underwent a conversion to flats and retail units. 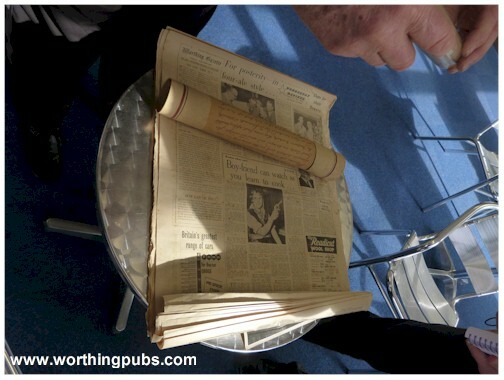 Paul Holden of the Worthing Journal recalled a story he had read in the archives last year (2011) about Frank's secret time capsule. 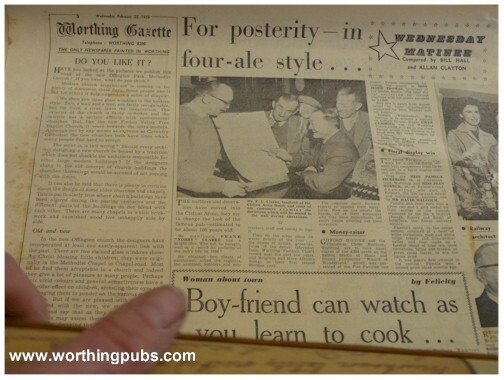 An article had appeared in an edition of the Worthing Gazette dated 25th February 1959. 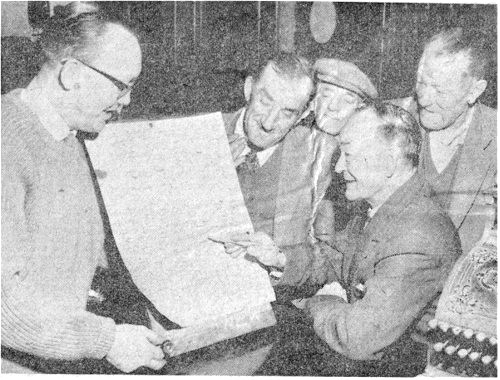 It included a picture of Frank holding the scroll with some of his regulars. Again the ever thoughtful Frank included a copy of the newspaper in the package. 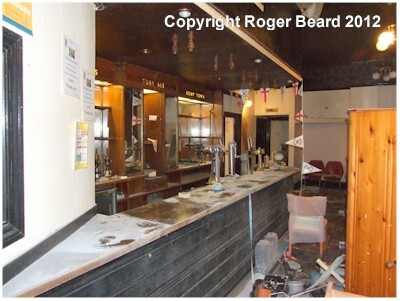 Paul dropped into the Clifton during its conversion in 2011 and spoke to the builder Roger. He asked if he would keep an eye out for the package. 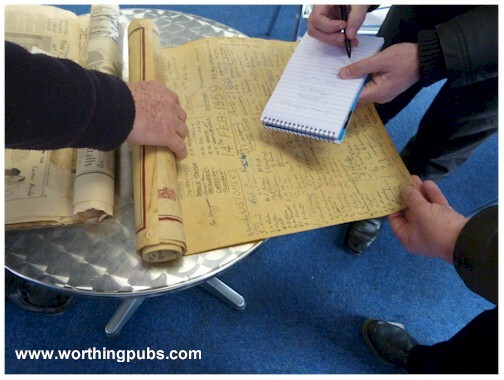 We at Worthingpubs.com also had an interest in the building work and Roger was kind enough to pass over a pictorial record of the old pubs interior as it was ripped out. In early 2012 Roger found the package walled up in the kitchen. As he said at the time, the kitchen was the last room to be renovated, the builders had been using it as a tool store room. 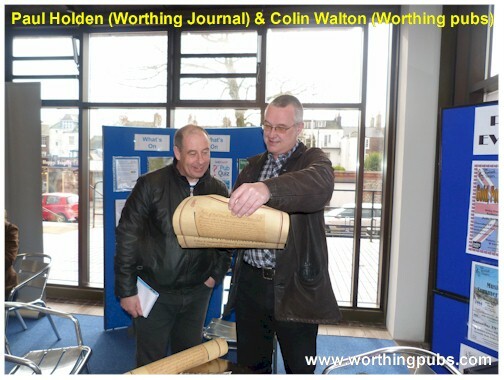 Roger sent out word of the find and he, Paul Holden and worthingpubs.com gathered together at Worthing library for the grand opening. 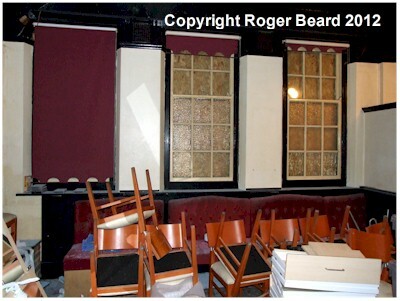 "The builders and decorators have moved into the Clifton Arms; they are to change the look of the famous pub - estimated to be about 100 years old. So Frank "Nobby" Clarke had a bright idea. 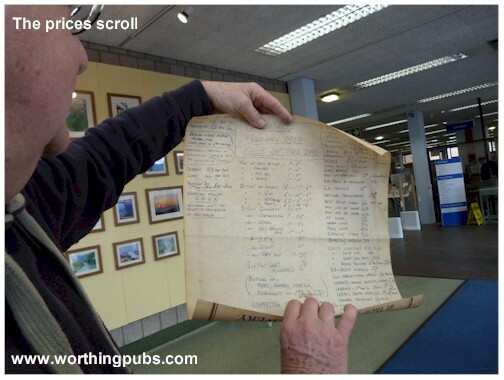 Why not, he thought, wall up a record for posterity of the pub's life in 1959? 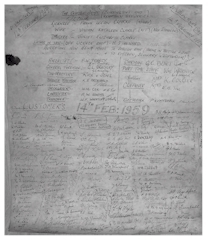 He obtained two sheets of parchment, asked the regulars, the architect, builders and contractors, staff and family to sign it. Then on the other piece he wrote details of the year . . . the prices of drinks, groceries, value of the dollar, television facts, Worthing football Club's record over the past few years, and Brighton & Hove Albion's doings in their first second division year. The regulars came forward eagerly to append their signatures. Now he has nearly 150 names, all of them customers who may have descendants 100 years hence pointing out their ancestors." 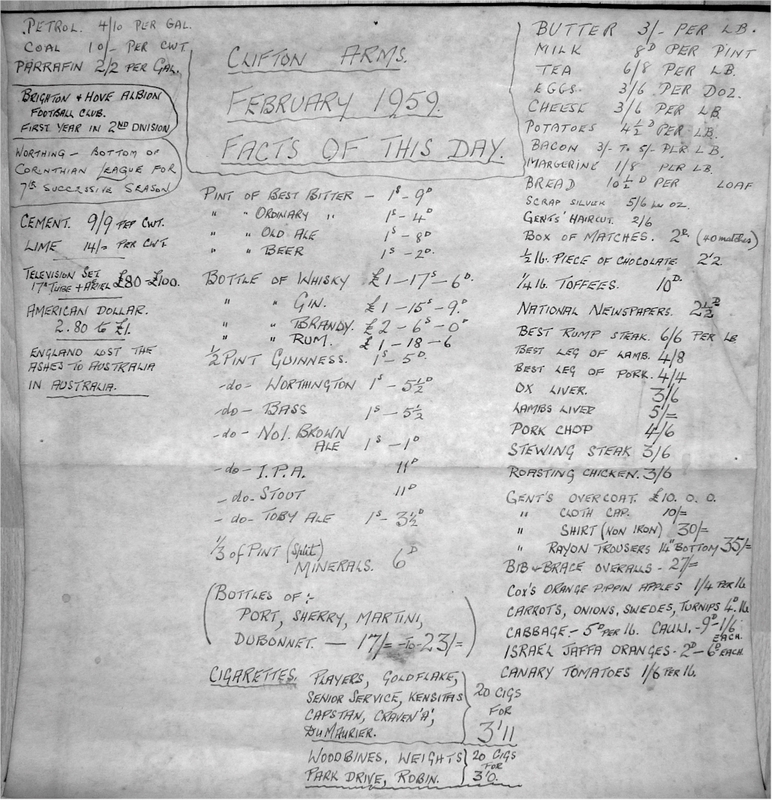 If you would like to read the scrolls just click on the pictures above for an enlarged version. is your name or family name on the scroll? (Click on the pictures on the left to find out) We would love to hear from you. 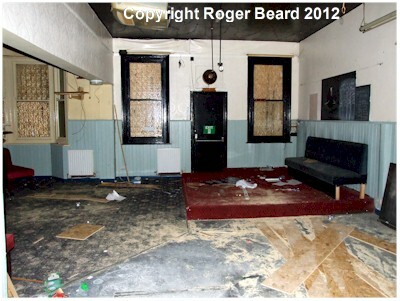 Do you have an original picture of the event, the pub itself or a story to tell that you would be happy to share. 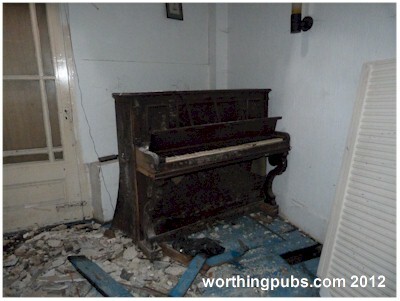 In fact if you have any information you would like to pass on about any Worthing pub we would be delighted to share it with our readers and researchers. Oh yes, almost forgot. 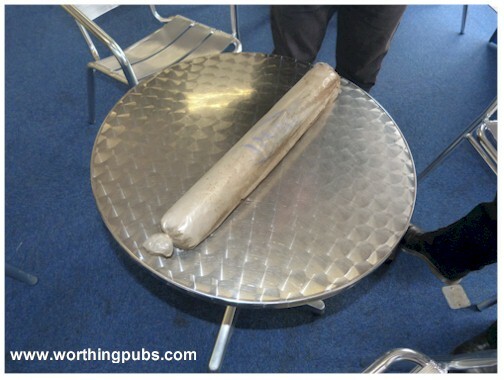 The Worthing Journal and Worthingpubs will be replacing the time capsule with an updated one before the building is finished. (update - regretably, this never happened). 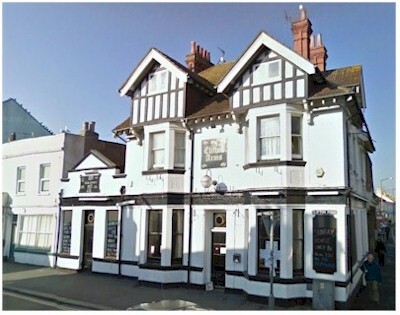 The Clifton Arms was thought to have been built in around 1863 and is situated on the corner of Clifton Road and Tarring Road. The length of Clifton Road was then known as New Town, a development in the 1800s featuring small terraced housing for the working classes at the time. The building was remodelled in 1895 in the Queen Anne style. A west extension was added in the 1920s. 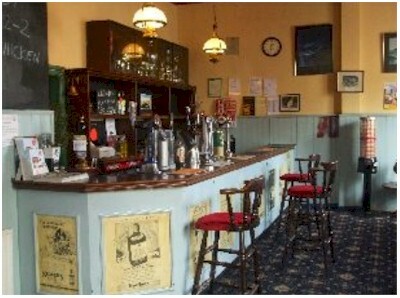 The pub is supposedly named after the Clifton suspension bridge constructed between 1834 and 1864. 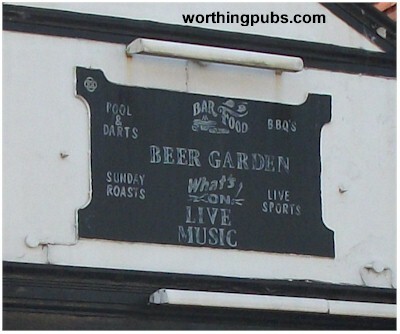 Allegedly, the pub sign (long time gone) depicted the bridge. The first recorded landlord was Henry Crunden in 1870. Mr Henry Funnell took over from 1871 to 1872. Willis Hardham took up the reins in 1873 and remained there for the next 15 years. 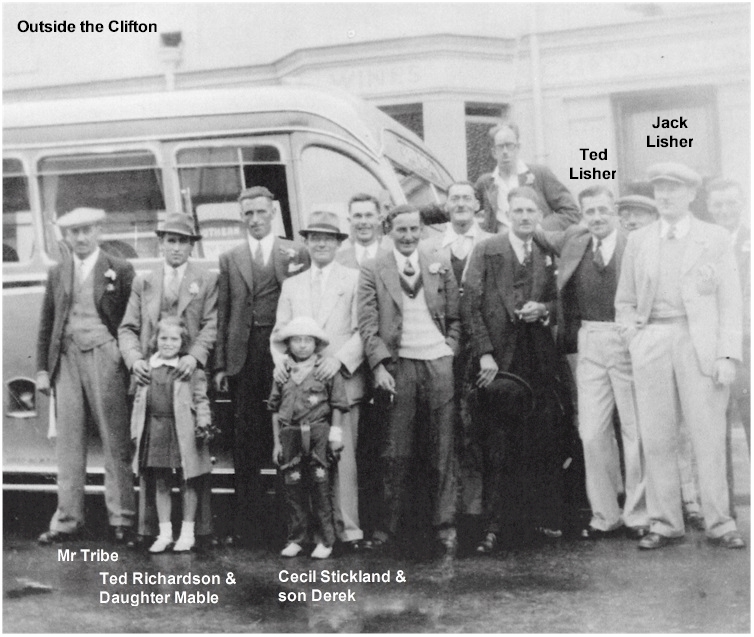 In 1888 David Brazier, his wife Kate and their nine children moved to Worthing and ran the Clifton. 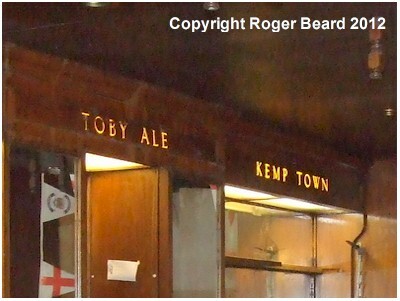 Kate's father had been a publican at the Stag's Head in Portslade. David's son Anthony David Brazier was running the business in 1895. 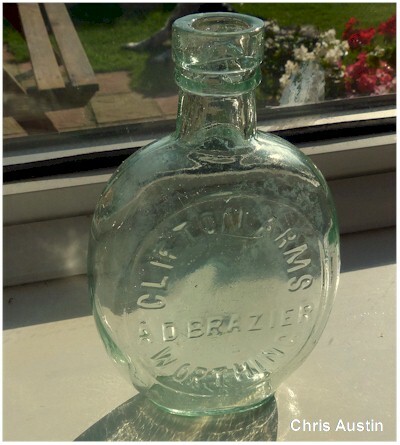 An unusual find by bottle collector Chris Austin of Worthing. It would appear to be a spirit bottle and would have been corked. As far as we are aware the Clifton didn't brew it's own beer or distil spirits and so this bottle is a bit of a mystery. 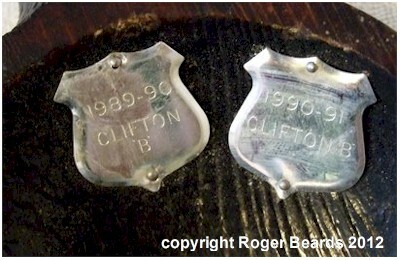 It is approximately six inches high and bears the legend: Clifton Arms - A D Brazier - Worthing. Anthony David's life came to a rather abrupt and unusual end in 1900. He was shot dead by his father! On the 3rd of October 1900, Dave (as he was known), his brother George and their father David were out rabbit hunting on the downs above Portslade. Dave, it would appear, was lying down by a rabbit hole when he stood up at the same moment his father took a shot at a rabbit. 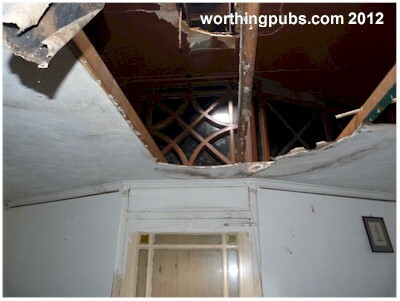 An inquest was held at the Battle of Trafalgar Inn in Portslade where a verdict of accidental death was recorded. No blame was attached to his father. His funeral was attended by upwards of two thousand people. 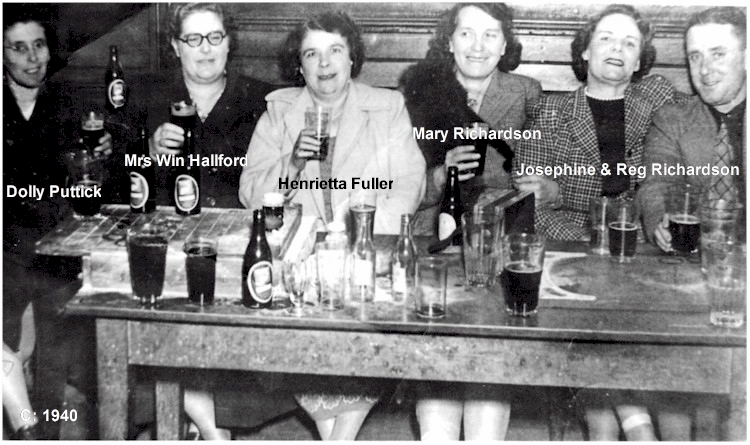 Dave's wife, Cecilia Brazier carried on with the pub from then until 1902. She remarried local Worthing corn merchant Edward Henry Isted. Rupert Cavendish Isted, brother of Edward Isted married Lillian Alberta Brazier (daughter of David and Kate Brazier) and they ran the pub from 1903 to 1906. From 1907 to 1909 George Thomas Brazier, who was the eldest son of David and Kate was in charge. In 1910 up until 1917 Henry Percy Brazier, Georges's youngest brother held the reins. 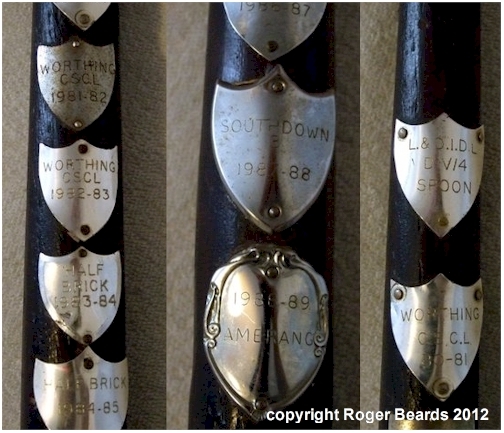 In 1918 it finally left the family hands and was passed on to Frederick Brownings. 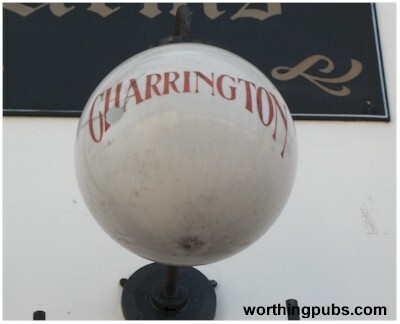 An original Charrington's globe light, unfortunately this one is damaged and of no value. 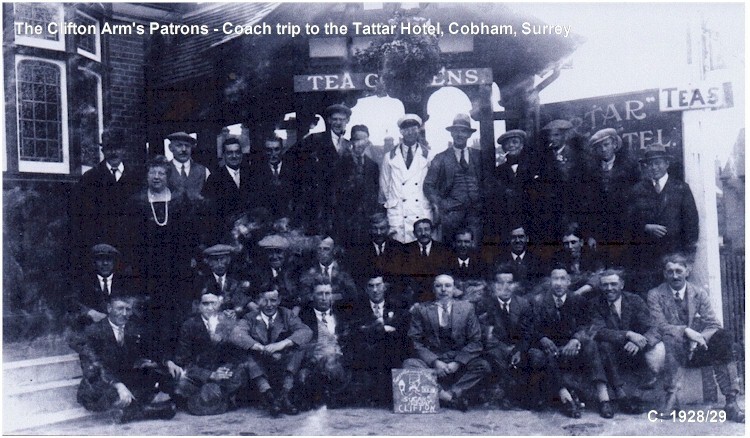 The Worthing & District Homing Pigeon Society held its annual prize night here in 1936. The picture directly above shows what was hidden by the false ceiling, an intricate window frame. 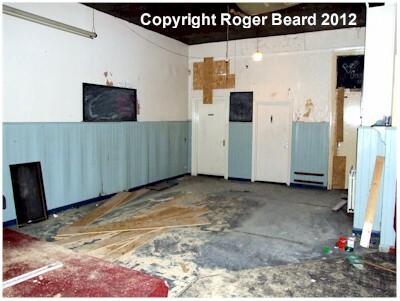 The picture to the left shows there's no money left in the pub business. Special thanks to Roger the builder for allowing me to use his pictures and taking me on a small tour inside. Found these cast iron barrel stands in one corner of the cellar, possibly original from the 1900's. 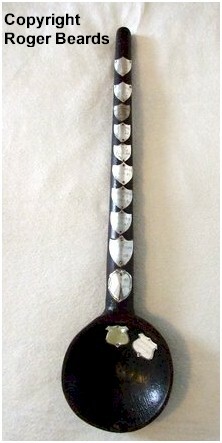 The words on the side are 'Burstow Brighton'. 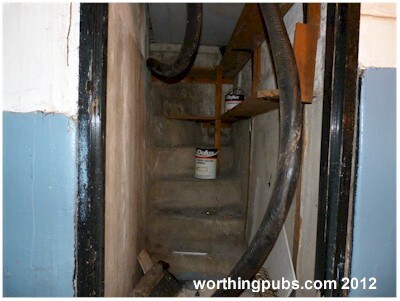 Also in the cellar a stairway to nowhere. 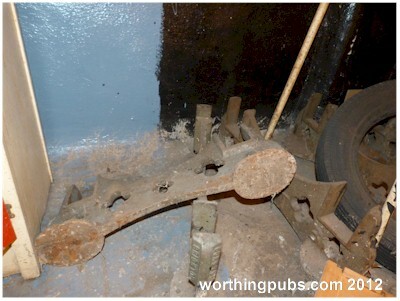 It used to lead up to a hatch just behind the bar. 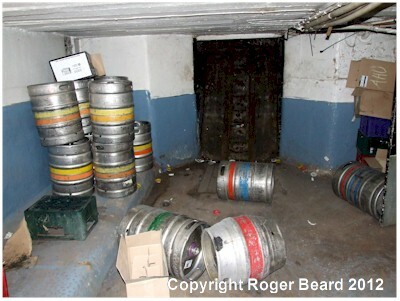 The entrance now was moved to a different position to prevent bar staff falling down the hole. 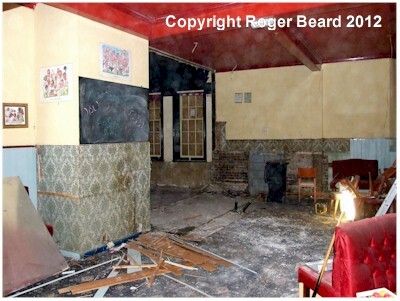 This used to be the pool room but originally it was the Off Licence area. Rescued from the rubbish inside the Clifton Arms is this carved wooden spoon that appears to be a Darts Trophy from around 1980 to 1991. Were you part of the team that won it one year? we'd love to know more, do you have any pictures? Our thanks to Tom for the use of these pictures. A photograph has recently come to light from Jan Flowers in Worthing. 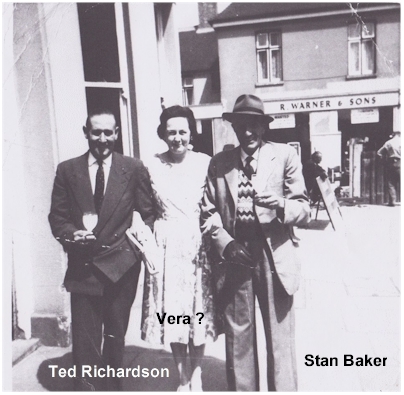 It shows her uncle Ted Richardson with Vera (unknown) and Stan Baker standing outside the Clifton Arms Pub. 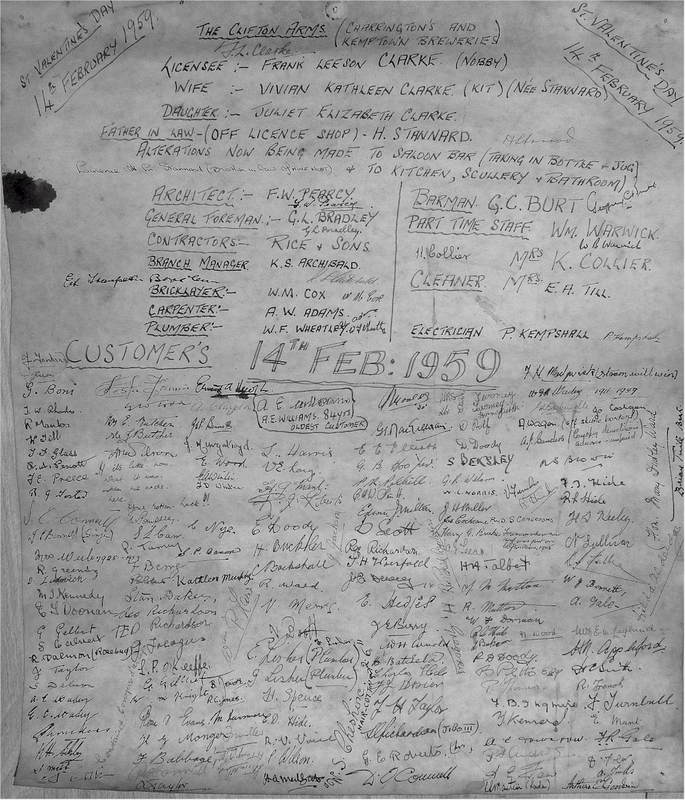 Ted Richardson and Stan Baker were two of the many regulars that signed the time capsule scroll on the 14th of February 1954.